TSA Approved Toiletry Bag-(7.9*5.9*2.4 inches), complies with the 3-1-1 rule for TSA screening. Make pass through security a pleasure. Safe to carry your cosmetics or toiletries in travel or to gym. Also design for men' shaving kit, women' beauty product, kids' stationery. Made with waterproof clear material. Waterproof keep item dry inside. Clear but not so bright, high visibility make check and get items a breeze. Semi-supple and compressible, save your space when not use. Detail-oriented Zipper. Sturdy zipper, zip up more smoothly. Large zipper opening, big zipper handle, easy pack and take. Suitable for all ages, men and women, as well as children, to meet the needs of their travel in the wash.The product is easy to clean and can be reused. TSA APPROVED: TSA Approved Quart Size Bags are Fully Compliant with TSA 3-1-1 Rules and Regulations of ALL Airlines. Makes Traveling and Passing Through Domestic and International Security Quick and Easy. Save Time and No More Hold Ups or Hassles at the Airport. 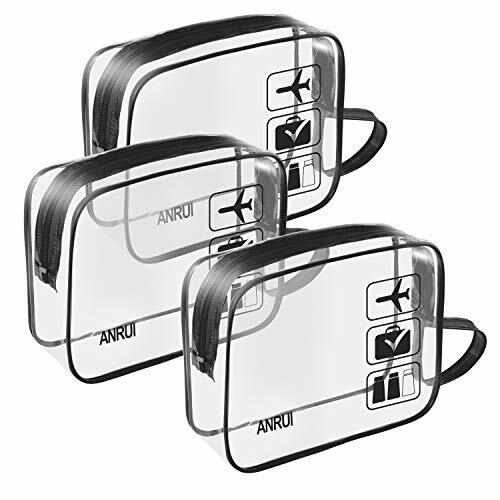 CLEAR, DURABLE, REUSABLE: Airline Toiletries Bags are Transparent, Waterproof Travel Pack to Hold all Your Liquids. Environmentally Friendly. PVC is Premiere Strength and Built To Last with you for the Long-term. STAY ORGANIZED: Clear Toiletry Bag for Air Travel Keeps your Bottles, Containers, Cosmetics,Small Toiletries, and Liquids in One Place. Bag is Easy to Clean After Use and Wash. BAG MEASURES is :7.2 x 5.5 x 2.5 Inches. If you have any questions about this product by ANRUI, contact us by completing and submitting the form below. If you are looking for a specif part number, please include it with your message.